Most of the world agrees: #stalking #women is a #crime. 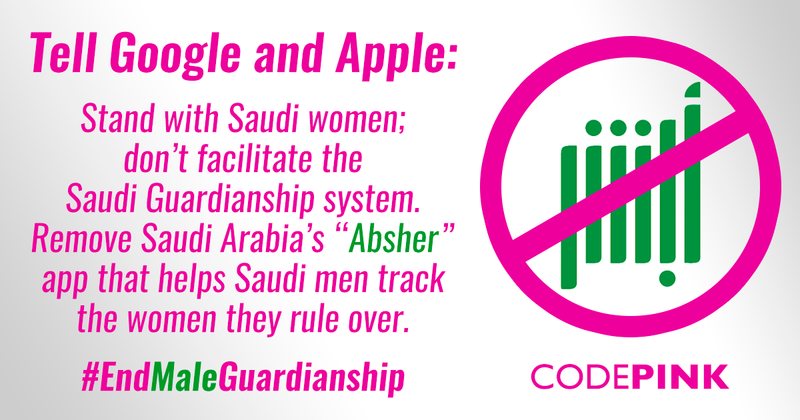 But in #SaudiArabia, male guardianship is not only legal but also part of the #system. As part of the kingdom’s efforts at “modernization”, the #Saudi #government has created a new phone #app called #Absher to help Saudi men track the whereabouts of the women under their control. It’s grotesque enough that Saudi Arabia has created this app, but why are #Google and #Apple providing it for #download in their app stores? Both companies have “inappropriate content” policies in place for the apps they provide, banning #bullying and #harassment from their platforms. If the Saudi male guardianship system isn’t #inappropriate, then I don’t know what is! Send a message now to Google and Apple telling them to immediately remove the Saudi Absher tracking app.